W.G. Sebald was one of our most visual writers. He was also one of our best. The German author, who spent most of his career in England, where he died in a car crash in 2001, has been called the last great author of the 20th century – an epithet that only makes sense because of his premature death: had he lived another decade or more (he was only 57) he would have likely been hailed one of the best writers of the 21st century. 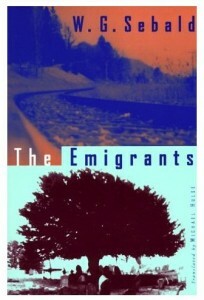 All four subjects of The Emigrants – a school teacher, an aging doctor, a legendary uncle, and a painter – are, as the title suggests, emigrants, Germans living isolated and abroad (Sebald knows that, to the emigrant, as much as a change in accent or language, a change in scenery emphasizes one’s foreignness, hence his masterful attention to the description of the landscape). The “order” that unites the stories of Dr Henry Selwyn, Paul Bereyter, Ambros Adelwarth and Max Ferber, however, is something more abstract. Theirs are as much interior emigrations as exterior ones: each lives a lonely existence, their connections to family and home truncated by historical events. The narrator, whose melancholy infuses the book, pieces together their fragmented “stories”. “Max Ferber,” the book’s final section, tells the story of a German painter* who, as a young man, emigrates to England in 1939; his parents, who stay behind, are arrested and deported, and he never sees them again. The narrator — — who has become an emigrant himself — meets Ferber in the late sixties in the once grand but now declining industrial city of Manchester, stumbling upon his studio by chance. Half the novella is the narrator’s retelling of Ferber’s life story, snatched in irregular visits over a twenty-year span. The other half is the recounting of the diary of the artist’s mother, given to the narrator toward the end of Ferber’s life, which extends the family history to the 19th century. Both are interwoven with the narrator’s own life and peripatetic memories. This is Sebald’s central interest, memory — personal, familial and cultural. Like his countryman and contemporary, artist Anselm Kiefer (see yesterday’s post), Sebald has explored the power, limitations and ethical responsibilities of memory. ** Memory is something Sebald does not wholly trust, but something from which he cannot turn away. Sebald’s gaze is always oblique, his prose carrying the reader down the stream of one narrative, while its shores are filled with forms of menace, absence and melancholy. This is why photographs – a seemingly fixed and reliable “memory” — enhance and complicate his texts, and why his descriptive powers are so important to a work like The Emigrants. *Painters and painting are frequently subjects in Sebald’s work: his 1988 long poem After Nature focuses, in part, on Matthias Grunewald; Rembrandt’s “Anatomy Lesson” appears both in The Rings of Saturn, his last “novel”, and On The Natural History of Destruction, his one non-fiction book; literary figures are the main focus of Sebald’s Vertigo, but the narrator’s peregrinations also take him to a Pisanello fresco by in the dark corner of an out-of-the-way chapel and Giotto’s Scrovegni chapel. **Considering the two artists together lays bare the different registers of words and images, but that is a subject for another place. Sebald’s use of photographs in his text elicits associations with many of his contemporaries, including Kiefer. For an extended conversation see Searching for Sebald: Photography After W.G. Sebald. For a short look at similarities between Sebald and Kiefer see this article by Tim Adams in the New Statesman.